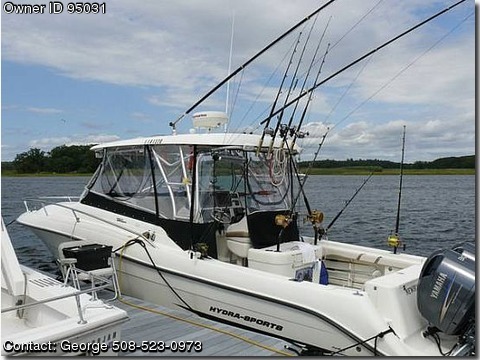 Call Boat Owner George 508-523-0973. Finder, Radar, Auto Pilot, VHF Radio Transmitter SeaTalk. Box, Anchor Box, Windless Anchor. Popup Cleats, 3 Gas Tanks 110 Gallons each. Tackle Station, Rocket Launcher's, 6 Rod Holders. Enclosure, Bolstered Captain's First Mate Seat. storage compartments, Sleeps 6, Stand up Shower, Head, Microwave. area under master Bed, Refrigerator, Hot Water Heater. Tops Granite Top Stow Away Dining table. There is no wood in the structure. Harpon, Tuna Body Bag, Sea Anchor, Custom Made Mackerel Bait Chopper. available for Sea Trial's after May 15, 2013.
which will be deducted after Purchase of Boat.